I’ve previously used this blog to gripe about lame street names that seem to evoke a sort of nature that housing developments often prevent, if not outright eliminate. No matter, I guess, since it’s a phony nature anyway. Today, however, I found a doozy while doublechecking a Santa Barbara street name. Yes, Hubba-Hubba Lane, which is only mildly better than Hubba Bubba Lane, which doesn’t exist. 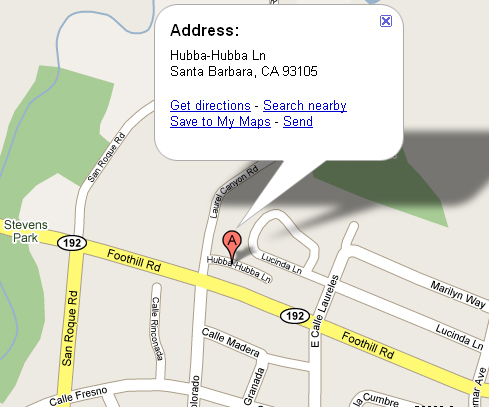 Live on Hubba-Hubba Lane? Work from home? Get a P.O. box, pronto, or risk having your business cards disseminated as novelties. What may well be the most oddly named street in Santa Barbara hasn’t escaped the notice of the online world, as it’s included in this cycling forum’s list of memorable street names. I hadn't realized you had done a word-of-the-week on mountweazel. I did one not too long ago on nihilartikel (http://kidicarus222.blogspot.com/2009/04/ceci-nest-pas-un-nihilartikel.html), and even though I was recently reminded of the existence of trap streets (or, that is to say, the non-existence of trap streets), it didn't even occur to me that this might be one. I don't think it is, however, since it's brought up on the article I linked to at the end, on a cycling forum that seems to be for people who have seen ridiculous streets as they rode past them. Hubba-Hubba Lane doesn't appear on the newer street map I have here in my office, but it does in another that predates Google Maps. So unless Google Maps copied another cartographer's trap street — which doesn't seem totally implausible, I'd guess the street is real.